Isha Vidhya, Isha Foundation’s thrust in the area of rural education, has just begun work on a new school – this time near Dharmapuri in Tamil Nadu. 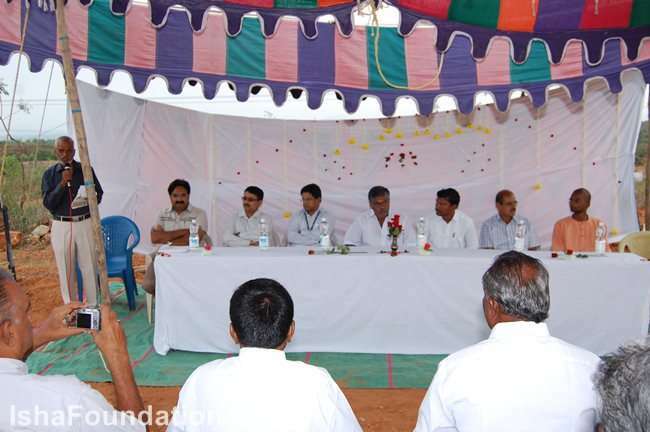 In July 2011, Mrs. Sudha Murthy, Head of Infosys Foundation, visited the Isha Vidhya School at Sandhe Goundanpalayam village near Coimbatore, and announced that that Infosys Foundation should sponsor the construction of Isha Vidhya’s next school. Isha Vidhya, Isha Foundation’s thrust in the area of rural education, has just begun work on a new school – this time near Dharmapuri in Tamil Nadu. Isha Vidhya is committed to raise the level of education and literacy in rural India and help disadvantaged children realize their full potential through computer-based education. The newest project has interesting beginnings. In July 2011, Mrs. Sudha Murthy, Head of Infosys Foundation, visited the Isha Vidhya School at Sandhe Goundanpalayam village near Coimbatore, and announced that that Infosys Foundation should sponsor the construction of Isha Vidhya’s next school. Following her commitment, Isha volunteers in Dharmapuri, after a comprehensive search, located a suitable site for the school in a very backward village called Samichettipatti, 18km from Dharmapuri town. Local businessmen and Mr. CK Venkataraman, COO of Titan Industries, contributed towards purchasing the land for the school. The building plan approvals have also been obtained and the Bhumi Puja for the new school took place on 22nd August. The function was graced by Mr. CH Krishnamurthy, a representative of Infosys Foundation as well as local dignitaries and donors. This will be the 9th Isha Vidhya school when it is completed and it will serve hundreds of children from the surrounding villages, whose population consists predominantly of farmers, agricultural workers and families of migrant laborers. Many of the students will receive scholarships from Isha. The school building is expected to be completed by May next year, in time for the academic year starting in June. Show your support for Isha Vidhya rural education initiative on Giving Tuesday, November 29.